In 1970, Bob Limbert, started his family owned business in Brisbane with a strong focus on supporting his customers by only building and supplying high quality equipment that has set the benchmark in many applications. Today, these high standards are still adhered to and many of the staff from those days are still employed here. The business has grown from Metal fittings to now include a large range of Poly Fittings and Poly fabrication along with a comprehensive range of Irrigators, supplying the irrigation, agriculture and industrial markets. 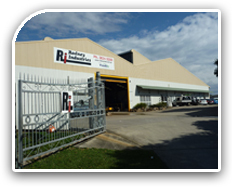 Our products are mainly sold throughout Australia by reputable, quality irrigation merchants. Our customer base extends to New Zealand, Japan, South Africa, United States, Malaysia and many of the smaller islands around the Pacific and the rest of the world. Along with our incredibly efficient Rainspan Range of Soft Hose Boom Irrigators, Rodney Industries has the sole Australasian distribution rights for the highly successful Marani range of Italian built Hard Hose Irrigators. We have a huge range of machines for all applications available with many in “stock”. We also have the distribution rights for Briggs Boom - the perfect partner for the Marani Hard hose, or can even be installed on our Soft Hose models as a folding boom option.